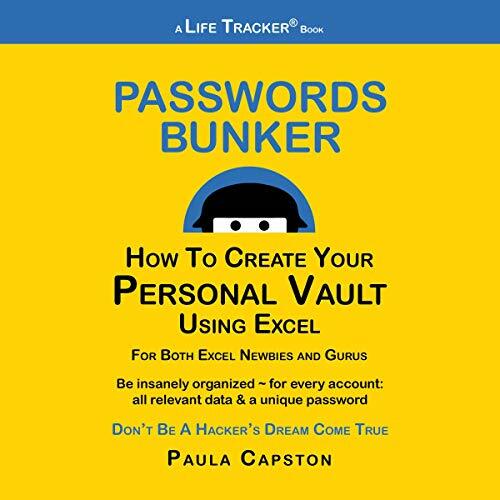 Passwords Bunker is easy but crafty. Create a unique password for every web account, plus store all its associated data. Then we show you how to password protect your password file! No fancy techniques or memory skills - Excel does the work. But no prior Excel experience needed! Your own bunker will be set up and functioning in less than 30 minutes. Then you can build at your own pace. It can be the one-stop place for the information that runs your digital life, in a Middle-Tech way. No more using the same passwords over and over or scouring your desk for a password scribbled on a scrap of paper. Because this resides in your spreadsheet program, no additional subscription is required, and Excel skills do not become obsolete.